Welcome to Trinity Allergy, Asthma and Immunology Care, P.C. Trinity Allergy, Asthma and Immunology Care, P.C. NOTICE: FDA News Release - FDA announces voluntary recall of Montelukast tablets by Camber Pharmaceuticals due to incorrect drug in bottles. Trinity Allergy, Asthma and Immunology Care, P.C. is a professional corporation devoted to helping patients with allergy, asthma, and primary immunodeficiency diseases. Trinity is located in Kingman, Arizona about 100 miles south of Las Vegas at 3931 Stockton Hill Road, Suite D, Kingman, AZ 86409 (opposite Home Depot). Trinity hopes to fulfill the healthcare needs of both adults and children residing in Mohave County. Trinity has two satellite offices. There is one in Bullhead City to serve residents and residents of Laughlin, Nevada and Needles, California. There is another one in Lake Havasu City to serve residents and residents of Parker, Arizona and Needles, California. Dr. Natarajan Asokan, the founder and president of the corporation, is a Board Certified Allergist & Immunologist and with excellent qualifications and extensive training. At Trinity, we believe in delivering high quality, state-of-the-art, compassionate and technologically sound healthcare services. If you, or your loved one, are suffering from an allergy, asthma, or primary immunodeficiency diseases, we are confident that we can improve the quality of your life and health. On behalf of Dr. Asokan & his staff at Trinity, We thank you for your time and patience! Hope to serve your needs soon! 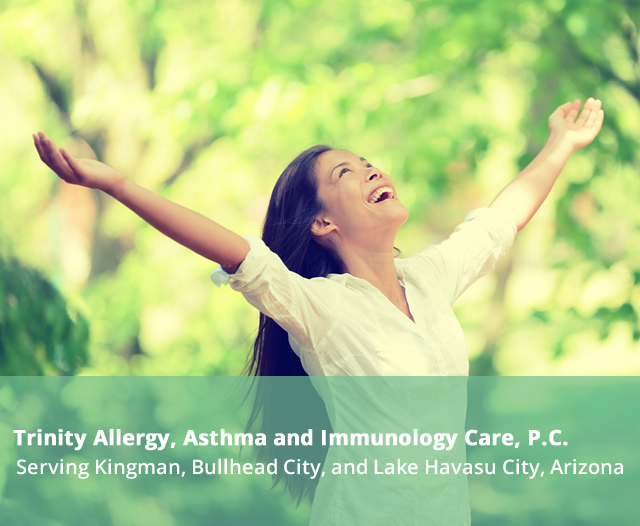 Why Choose Trinity Allergy, Asthma & Immunology Care, P.C.